The organisers of the popular Super Stack United Kingdom poker series have announced the schedule for the 2016 edition of their weekend tournaments. Once again, all events will take place at The Poker Room, which is above The Grosvenor Victoria Casino London on Edgware Road, with the first £220 ($333) buy-in tournament set to run from January 14 to 17. A new year will bring with it a new structure, complete with a trio of opening day flights. All Day 1A action will get under way from 8pm on Thursdays with late registration open until 11:30pm. The same times apply for Friday flights with a finish time of around 3am expected for both. The third and final 2016 opening flights will follow from 4pm on Saturdays with late registration available until 7:30pm alongside an expected finish of around 11pm. One re-entry is to be allowed per flight with all Day 1A survivors returning from 1pm on the Sunday to compete for the title and the cash. 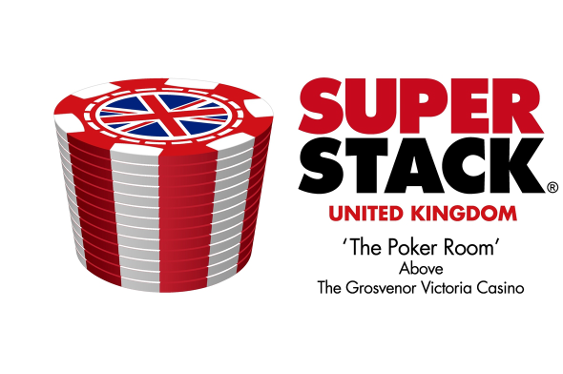 But, before all this there is still the final event of the 2015 Super Stack United Kingdom to take care of; a £165 ($250) buy-in tournament featuring four Day 1A days from which to select. One re-entry is permitted in each flight while the final day is set to start from 2pm on the Tuesday.